I’m probably the most humble person on the planet. When people ask me how I stay so humble, I just tell them that it’s a gift. I also warn them not to try to be as humble as I am because my humbleness sets unrealistic expectations. Don’t try, kids. As soon as you think you are more humble than I am, I’ve already become more humble. In fact, I’m more humble now than I was when I started writing this. I’m like the Obi-Wan Kenobi of humbleness. 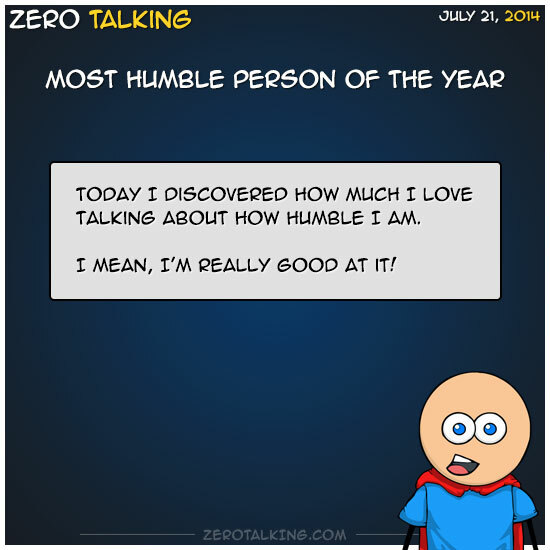 Today I discovered how much I love talking about how humble I am. I mean, I’m really good at it! I’ve decided to publish a 12 month calendar of pictures of me being humble. I’m super humble looking in January, but I look really good in October, too, because it’s a Halloween theme and I’m in an awesome costume that really brings out my creative humbleness. But in December, you can really see it in my eyes. It’s amazing. I’m thinking, “I’m too humble for this t-shirt” t-shirts, too.